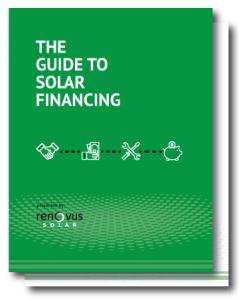 The ​Guide to ​Solar Financing ​is the be-all-end-all guide to making solar simple and affordable at almost any budget. When Renovus opened it’s doors, financing a solar system wasn’t a possibility for all but the most entrepreneurial banks and credit unions. 10 years later Renovus has helped develop and facilitate some of the best value solar loans on the market. Download this guide to ger a crash course on going solar with solar financing and low monthly payments.